Purchasing departments have mastered what it takes to get unsuspecting salespeople to sweeten a deal. 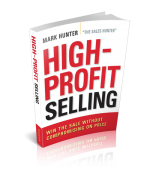 If you don’t want to be one of those salespeople, you need to get wise about their techniques. Never give any company 100% of the available business. By maintaining two sources of supply, they can play one against the other. Use flexibility in payment terms and the threat of slowing payment, unless a lower price is received. Solicit bids from as many suppliers as possible, regardless if they already know which supplier they want to use. They often do this for no other reason than to have multiple offers they can then leverage with the preferred supplier. Leave a few items vague on a bid to give suppliers flexibility in their response. This will equip the purchasing department to then use the new ideas against the other suppliers. Tell you they have a 3rd party group that can take care of their needs at a lower price. Alter ordering quantities or supply-chain needs at the last minute, unless payment terms are modified. Leverage orders with companies against the supplier’s fiscal year-end. This makes it harder for a supplier to make their sales number without offering a lower price. Just prior to receiving a proposal from a long-term supplier, email them a copy of a competitor’s proposal asking for their feedback. They do this as a way of simply making people feel nervous. Make comments about the supply-chain and escalating costs and how they will be passed along to suppliers who aren’t offering lower-price options. Simply become hard to reach, giving the impression to suppliers what they sell is not needed. If you think you’ve never had any one of the items listed above used against you, then you’re either brand new to sales or you’re only selling to your relatives. The list is by no means exhaustive, but it does cover many techniques purchasing departments use. At the same, don’t think every purchasing department uses every one of the above 10. Each purchasing department has their own buying philosophy and policies they need to follow. Key is to never allow yourself to believe the purchasing department you’re dealing with isn’t capable at any point of doing something that will impact your pricing. Just because purchasing departments are aggressive in getting better pricing doesn’t make them evil. No, they’re merely doing their job and that’s no different than what you’re tasked with doing. If you haven’t already, register for TODAY’s FREE webinar by clicking on the image below. Virtual Sales Kickoff 2016 is sponsored by The TAS Group, Cirrus Insight and Velocify! It’s just business and we don’t need clients that do business that way either. When we know they are playing games by what you described, we tell them’ thanks but no thanks’, sit back watching from time to time for a change in buyers or some other trigger event when we will test the waters again for people who appreciate the golden rule. Life is too short to waste time on aholes.